Raspberry Mint Sorbet Bustle Dress Part the Third: The Hat – Both the Making and In Action! If you’re just joining now, here’s the first post, about the skirts, and here’s the second, about the bodice. I started thinking about the hat while I was finishing sewing the dress. 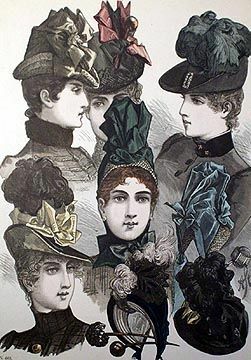 In looking at mid-1880s fashion plates I quickly knew I wanted to do one of those small-but-tall crowned hats from the period. They just look so pert and jaunty – and have such ridiculously fun trimming! If you’re just joining, this is the second in a small series of posts about my most recently completed project, which I dubbed the Raspberry Mint Sorbet bustle dress, for probably pretty obvious reasons. Here’s where we left off (because I haven’t shown this image enough already, lol) – which is where I left off last summer (post covering the skirts here). 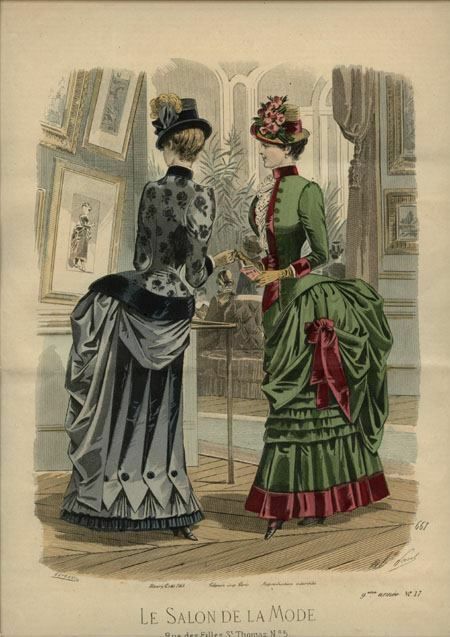 My initial inspiration for the bodice was this fashion plate that I also liked for showing a similar colour combination to my own, which still feels a little too, I don’t know, for HA. If you saw my post about this year’s historical sewing plans then you may remember my mentioning this UFO that I started on a whim last summer. I got as far as having the skirt mostly finished before it was time to start fall sewing, at which point I was all about fall colours (which I love SO MUCH) and this make instead of summery ice cream-like colours. Fortunately, it did not have to languish in the UFO pile for terribly long. In the winter I received an invitation to a Victorian picnic in May. I ended up not being able to go as I was attending a conference in England over the same weekend. 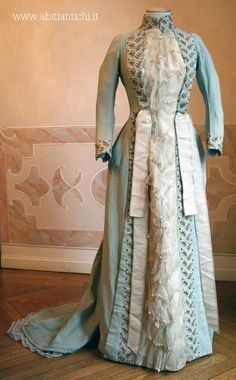 However, as luck would have it I received an invitation from another friend for a Victorian picnic in June so I didn’t lose my incentive for finishing this ensemble! Hooray for UFO-busting! I’ve decided to do a post for each component of this ensemble (skirts, bodice, hat, everything together and “in action”) to keep it manageable. This project was finished about a month ago, but I only just got photos of me in it this week, so waited until now to do a proper post. I started this early in the year and used it as my entry for the Historical Sew Monthly challenge for March: Stashbusting. As part of my adventures in Natural Form foundations garments I also made a new corset. This is something I’d wanted to do for a while anyway. 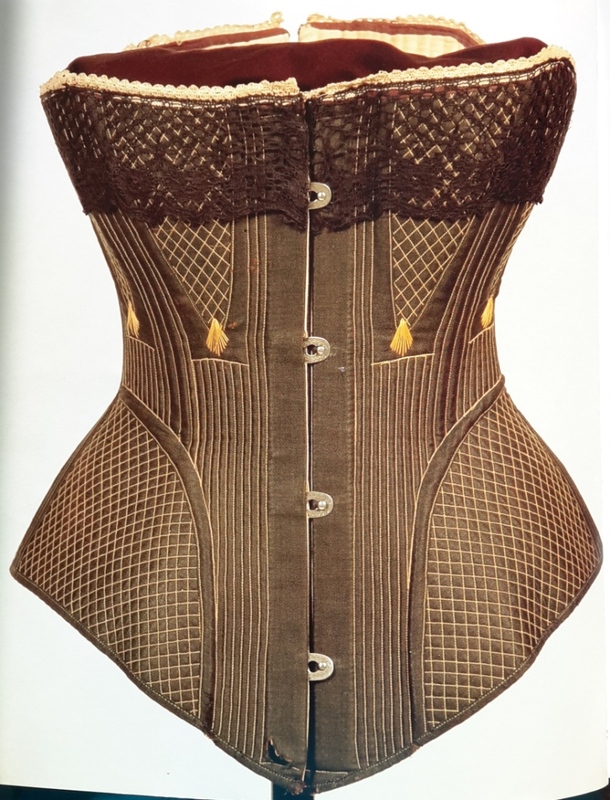 My previous Victorian corset was fine, but I wasn’t getting quite the curve in my figure or roundness in my bust profile I wanted. It also makes my hips sore because – and this was a big revelation for me! – there wasn’t enough fullness at the hips built into the corset. Duh! One of those things that seems so obvious once you realize it. The adjustability gained from having a lacing gap at the back will get you only so far! Historical Accuracy: Ummm……..let’s say 75% – ish? I used a pattern lifted directly from an original (or supposed to be), a combination of machine & hand sewing, fairly period appropriate or at least plausible fabrics. However, the trimming isn’t quite right and the fabrics aren’t likely 100% right. Total cost: I’m going to guess approx. $100 overall, over the course of some years. The velvet has been in the stash several years, the silk only a few months, the trim was bought for the project. First worn: last weekend – keep reading or scrolling down to see! So, where did I leave off…..oh yeah, the sleeve construction. I decided probably the easiest way to explain how the sleeves get sewn into the body of the Dolman is to draw a little diagram. This is an outline tracing of the pattern image, the dotted lines in black and red are my additions. 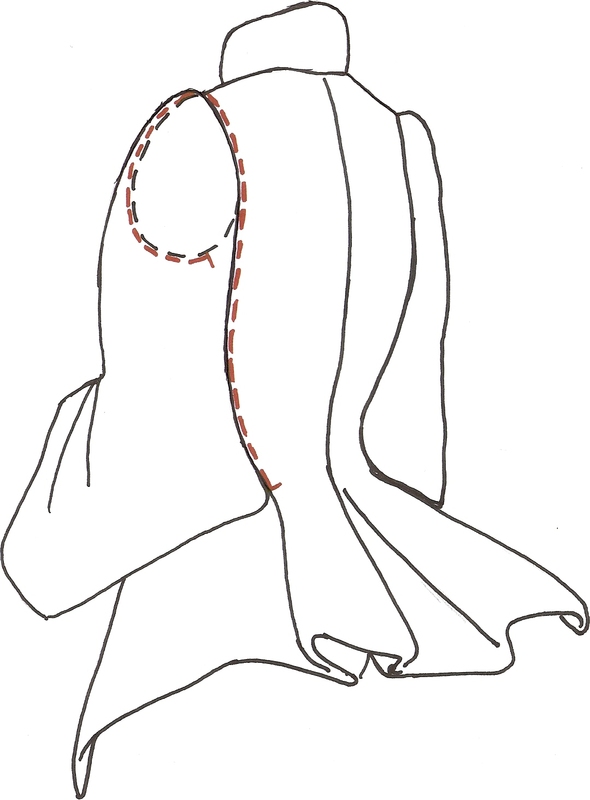 The dotted black line is the Dolman armhole (probably pretty obvious) and the red dotted line represents how the sleeve is attached to the body of the Dolman. The space towards the back of the armhole is intentionally not dotted red because the sleeve is not sewn all the way around the armhole. I hope this makes sense, along with a couple of photos towards the bottom of this post. If it seems like I’m over-explaining this, it’s really just because of how long it took me to realize how this works, lol. Today I got to do something I almost never get to do: play dress-up with other people just for fun! *Warning: this is an image-heavy post* It would actually be really great to get some feedback about this: what do you think of the photo size? How are they for loading? (I didn’t compress them before posting) Are there too many? Any and all (constructive) feedback would be most appreciated! 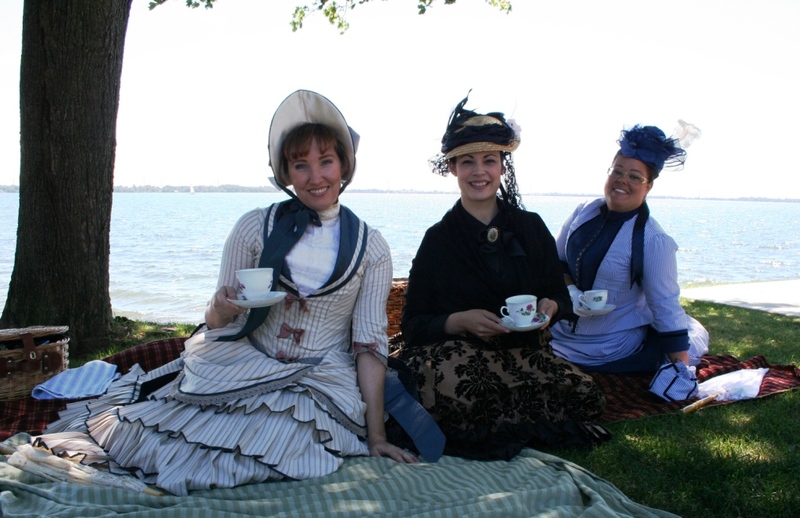 My new-ish historical sewing friend, Sarah, invited me to come along with her and a friend, Edith, to dress in our 1880s outfits and go for a picnic. 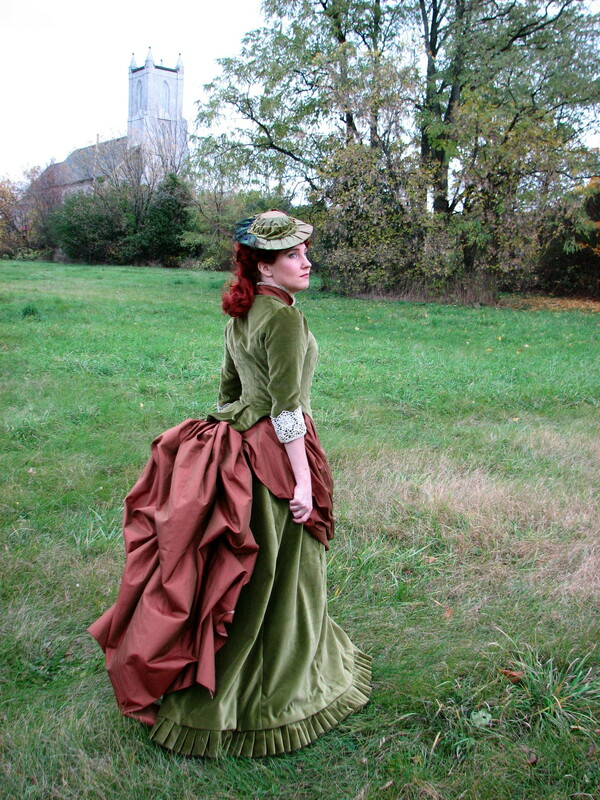 Over May & June I had made an 1880s summer outfit for an event in July, but hadn’t gotten good photos of it yet. I knew this would be a perfect opportunity, and who can resist a picnic on a beautiful day? Especially since Sarah actually brought real china tea cups to drink out iced tea in (she made an earl grey iced tea with a bit of cinnamon, which was SO lovely, I made one with Lady Grey tea). 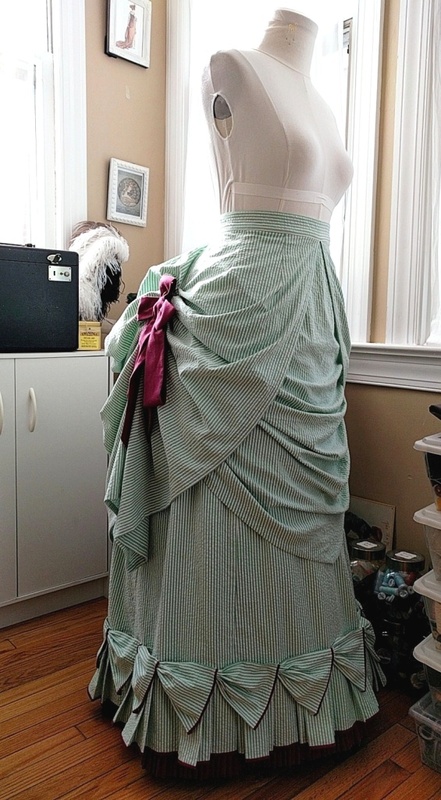 I’ll try to do a post or two more about this outfit showing the insides of the bodice, maybe featuring the bonnet, and talking more about fabrics, construction, process. Today, it’s all about the pretty shots! Ladies Who Lunch – Old School!